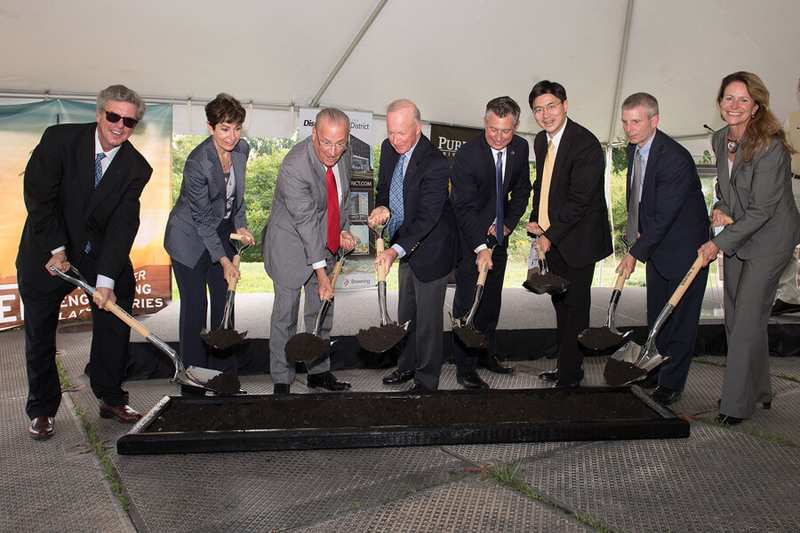 A groundbreaking alumnus of Purdue University helped break ground Friday (September 21) on SEL Purdue, a 100,000-square-foot facility for electric power research that will support 300-plus new high-tech jobs and serve as an anchor in the university’s Discovery Park District. Officials from Schweitzer Engineering Laboratories, Purdue University and Purdue Research Foundation broke ground Friday on SEL Purdue, which will focus on electric power research and support 300-plus new jobs in the university Discovery Park District. Pictured are Dan Hasler, executive vice president for communication; Beatriz Schweitzer and Edmund Schweitzer III, founder of Schweitzer Engineering Laboratories; Purdue University President Mitch Daniels; Chris Cotterill, chief operating officer for the Indiana Economic Development Corporation; Mung Chiang, Purdue’s John A. Edwardson Dean of the College of Engineering. ; David Whitehead, chief operating officer for SEL; and Jana Schultheis, director of property management for SEL. Edmund O. Schweitzer III, founder, president and chief technology officer of Schweitzer Engineering Laboratories, and his wife, Beatriz (Bay-a-treez) Schweitzer, took part in the ceremony. SEL joins Rolls-Royce as the second international corporation to put a stake down in the Discovery Park District’s “work-live-play” concept, which gives companies the opportunity to interact with Purdue faculty, staff and students and to tap into the university’s strengths and assets. Edmund Schweitzer III, who earned his bachelor’s and master’s degrees in electrical engineering from Purdue in 1968 and 1971, created the first digital protective relay in 1982, revolutionizing the electrical protection industry. His company can now identify a fault to within 100 feet on a 100-mile line and trip the breakers in a millisecond or two. His grandfather, an 1898 Purdue graduate, developed the first reliable high-voltage fuse. 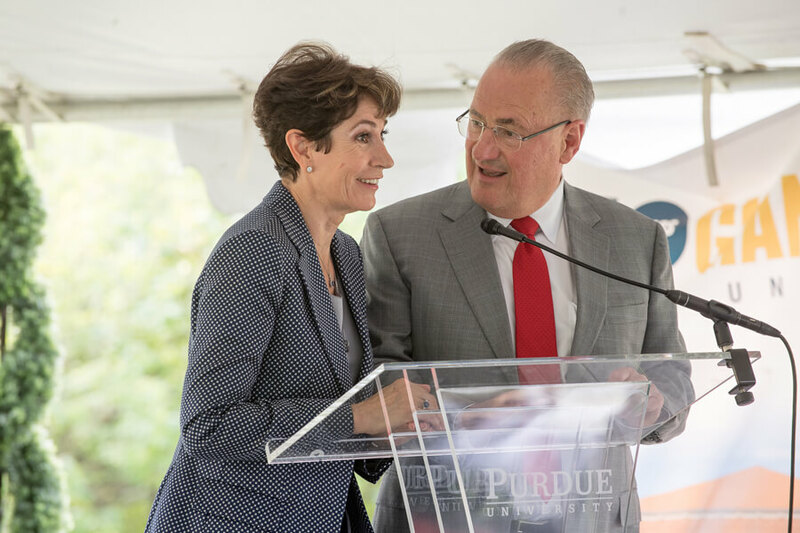 Edmund O. Schweitzer III, founder, president and chief technology officer of Schweitzer Engineering Laboratories, and his wife, Beatriz Schweitzer, speak at the groundbreaking Friday of SEL Purdue, a 100,000-square-foot facility for electric power research. The facility will support 300-plus new high-tech jobs and serve as an anchor in the university's Discovery Park District. “We’ve been talking a lot about giant leaps at Purdue as we celebrate our 150th anniversary. This is a giant leap for the Discovery Park District,” Purdue University President Mitch Daniels said. 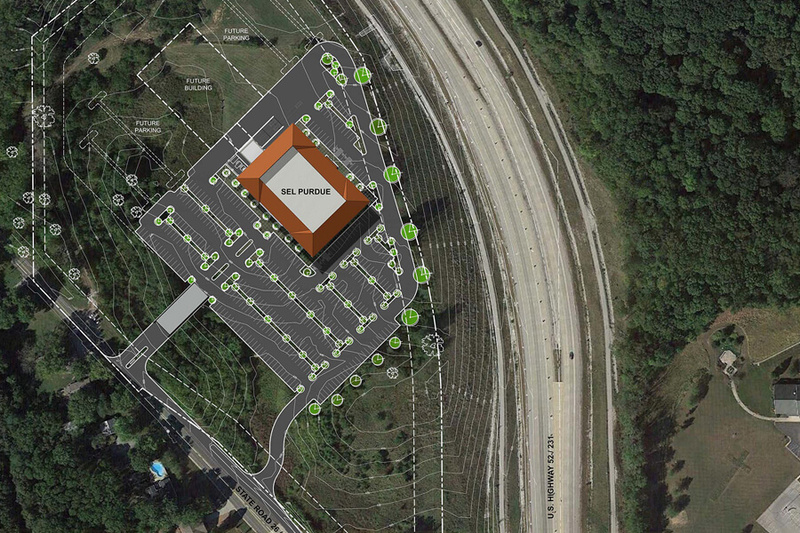 SEL Purdue will conduct electric power research and development on 10 acres of a 20-acre plot on the northwest corner of U.S. 231 and State Road 26 in West Lafayette across the road from the Purdue Technology Center Aerospace. The $1 billion Discovery Park District is a 30-year plan to transform the west side of the Purdue University campus by combining collaborative office and lab space with residential homes, pavilions, green space, walking paths, restaurants and retail. The Schweitzers also donated $1.5 million to the School of Electrical and Computer Engineering, or ECE, earlier this year to endow a professorship, and another $1.5 million to support the school’s power and energy systems research area, now named the Schweitzer Power and Energy Systems. A depiction of what SEL Purdue, a 100,000-square-foot facility for Electric power research, will look like. 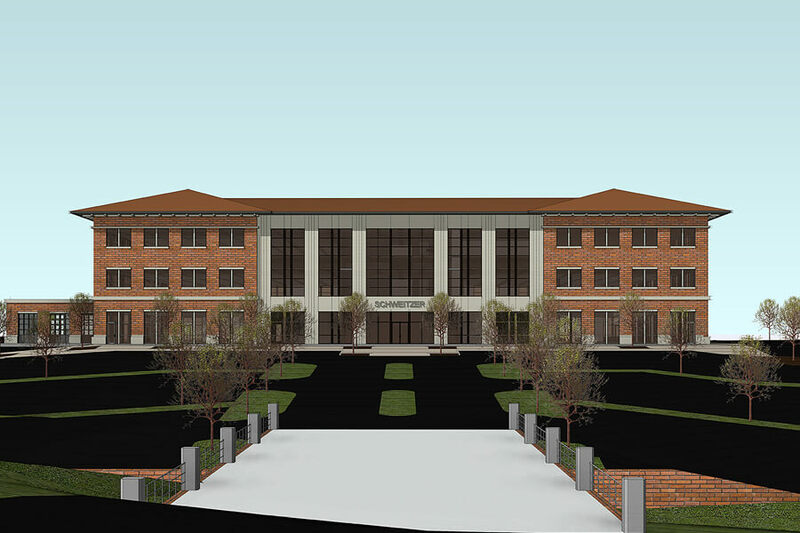 Edmund O. Schweitzer III, founder of Schweitzer Engineering Laboratories and a Purdue University alumnus, helped break ground on the new facility on Friday along with his wife, Beatriz Schweitzer, and Purdue University President Mitch Daniels. The Purdue School of Electrical and Computer Engineering is one of the largest in the United States and both its electrical engineering and computer engineering programs are ranked in the top 10 nationally. Chris Cotterill, chief operating officer for the Indiana Economic Development Corporation, also welcomed SEL to Indiana. An overhead look of where the new SEL Purdue facility will be built along with plans for where a second building could later be constructed. SEL Purdue will support 300-plus new high tech jobs and serve as an anchor in the university’s Discovery Park District, joining Rolls-Royce as the second international company in the district.